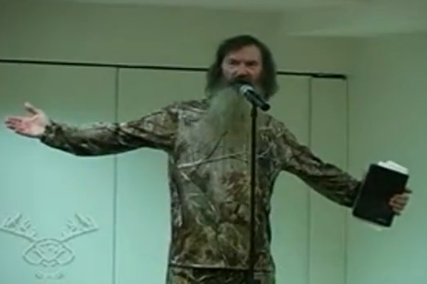 Duck Dynasty stars are Christian evangelists who frequently preach at their local church. A ministry assistant at White’s Ferry Road Church of Christ in West Monroe, Louisiana, told TMZ, Phil Robertson and his family have been active at the church for more than 30 years. Phil Robertson regularly gives fiery sermons -but last weekend, the entire family joined in, when the church celebrated Duck Commander Sunday. The Duck Commander Sunday is a yearly tradition where the entire Robertson family preaches to the congregation in full camo. The tradition existed long before the A&E reality show.